(1) Switch to the ON, the flash will start charging (the charging indicator is dim). After several seconds, the charging indicator turns red and TT560 is ready to shoot. Press the MODE key to M Mode. Nikon DSLR. Universal low-pressure trigger flash,and S1,S2 wireless trigger flash. Automatic saving function keep the current setting to the flash light saved. Flash mode: M,S1,S2. Flash duration: 1/200 seconds~1/20000 seconds. Neewer Speedlite TT560 Shoe Mount Flash. Condition is Used. Used only 3 times. Shipped with USPS Priority Mail. For a test flash, Press the test button to fire a test flash with the current mode settings. Flash mode: M1,S1,S2. Color temperature: 5800K. Net Weight: 315g. Power Tool Battery. Product Feature Guide Number: 33 (ISO 100/1M). The Cactus RF60X is a 2.4GHz radio-based wireless portable flash with a built-in transceiver that runs on 16 channels. The effective distance between the RF60X Master and RF60X Slave is up to 100m (328 feet). For a test flash, Press the test button to fire a test flash with the current mode settings. Flash mode: M1,S1,S2. Color temperature: 5800K. Net Weight: 315g. 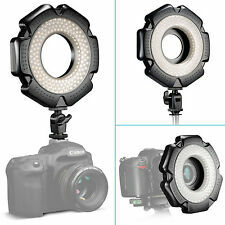 Neewer R-160 160 PCS 5600K 10W Mini LED Macro Ring Light with 6 adapter rings. Neewer R-160 160 PCS 5600K 10W Mini LED Macro Ring Light with 6 adapter rings (49mm/52mm/55mm/58mm/62mm/67mm)for Macro Canon/Nikon/Sony/Sigma/Tamron Lens. Sigma EM-140 DG Ring Light/Macro Flash for Nikon New Open Box FREE SHIPPING!!! This is a new opend box Sigma EM-140DG Ring LIght Flash for Nikon. 5 out of 5 stars - Sigma EM-140 DG Ring Light/Macro Flash for Nikon New Open Box FREE SHIPPING!!! 9 product ratings9 product ratings - Sigma EM-140 DG Ring Light/Macro Flash for Nikon New Open Box FREE SHIPPING!!! New, never used, in box. SIGMA APO TELE CONVERTER 1.4x EX DG for Nikon F. + SIGMA POUCH. EXCELLENT! Included in this listed: -Neewer TT540 Speedlight Flash -Neewer Radio Trigger Remote -Neewer Flash Bracket/Camera Arm Camera not included! Only pictured as a model. Everything you need for a bigger flash! Works with any camera that accepts universal hotshoe. If your camera doesn’t, you can always buy an adapter. All are pre-owned but saw little use, some minor wear (see photos) all items are in working order. Trending at $27.56eBay determines this price through a machine learned model of the product's sale prices within the last 90 days. Barely used. Works great, don't need it anymore since i upgraded. Trending at $23.15eBay determines this price through a machine learned model of the product's sale prices within the last 90 days. S2 mode is similar to S1 mode and is also known as “preflashing cancel mode”,but it can ignore the preflashing from TTL,so you can use it to support the main speedlight that working in TTL mode.In particular,if S1 mode is unable to synchronously flash with your built-in speedlight,you can try to use S2 mode. Excellent condition. Functions perfect. Includes 55, 58 and 72mm adapters, and batteries. 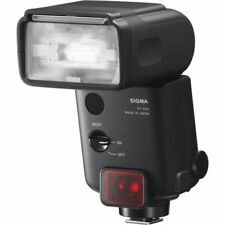 The Sigma EF 630 Flash system is the latest in DSLR flashes from Sigma. For ultra-wide angle shots, photographers can utilize the built-in Wide Panel to cover an angle of up to that of a 17mm lens. Like all SGV products, the Sigma EF 630 can be connected to update it via the Sigma USB docking station for flashes. 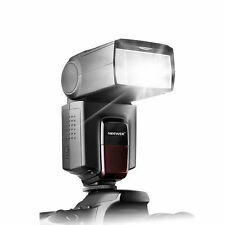 Neewer TT560 Flash Speedlite for Canon Nikon Panasonic Olympus Pentax and Other . Condition is Used. Shipped with USPS Retail Ground. The RF60X is a 2.4GHz radio-based wireless portable flash with a built-in transceiver that runs on 16 channels. The effective distance between the RF60X Master and RF60X Slave is up to 328 feet (100m). Nikon DSLR. Fujifilm DSLR. Samsung DSLR. RICOH DSLR. Universal low-pressure trigger flash,and S1,S2 wireless trigger flash. The flash is easy to use and set up and it operates on a set of 4 AA batteries. One (1) flash as pictured and described. Drop us a line and we will assist if we can. not included . We all rally together under the battle call, "Hey! That's not junk!". Bringing about that shift. Manufacturer Part # F50954. Boost the light in your scene with the portable EF-630 Electronic Flash from Sigma. Compatible with Canon E-TTL / E-TTL II. Features built into this unit include a modeling light function, so users can test out how the final image will look before taking the shot. Neewer Speedlite TT560 Shoe Mount Flash. Condition is Used. Shipped with USPS Priority Mail. Note: Although not pictured, the mounting foot is included. Good but Used Condition - Sigma Flash is used and works great - no issues, minor wear from light use. Can incorporate wireless TTL flash photography, slave flash photography, and FP flash photography. Great condition. Used once. See photos. 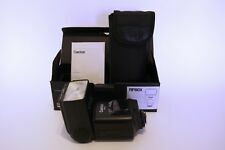 Neewer Speedlite TT660 Shoe Mount Flash for Konica, Minolta, Canon Never used . Shipped with USPS Priority Mail. Do not have box but have protected case for it. Neewer Speedlite TT560 Shoe Mount Flash for Konica Minolta. Shipped with USPS Priority Mail. This flash can be effective at ranges of over 131 feet. Plus it features a powerful built-in 3-LED light that is ideal for shooting video. It can also be used as a model ing light or as an AF assist light during Live View shooting. The flash features a guide number of 45 with ISO 100 The Modeling Flash function makes it possible to check for reflections and shadows before actually taking the flash picture. A wireless flash function is also available, when the EM-140 DG is used as master and the EF-500 DG SUPER as a slave unit for creating fine shadow details.High Speed Synchro and Exposure compensation functions are also available for advanced flash photography. Appearance of the item. Including Case. I will look it for you. I will provide courteous and responsive service. There is no problem or impact when taking photos. Neewer TT560 Flash Speedlite. CANON LENS. General Interest. CASIO LENS. NIKON LENS. Neewer Speedlite TT560 Shoe Mount Flash. Comes with velvet carrying bag. Excellent like new condition. Shipped with USPS Priority Mail. 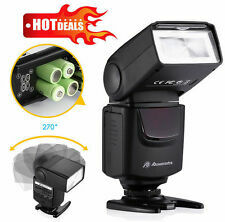 Neewer TT560 Flash Speedlite for Canon Nikon or Other DSLR Cameras. Condition is Used. Shipped with USPS Priority Mail Small Flat Rate Box. 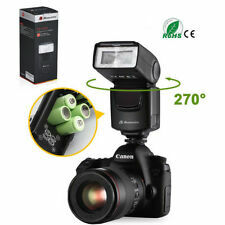 Neewer TT560 Speedlite Flash for Canon. You should not use this information as self-diagnosis or for treating a health problem or disease. Appearance of the item. Excellent . It works properly. When the built-in Wide Panel is used, the flash can cover the angle of 17mm. 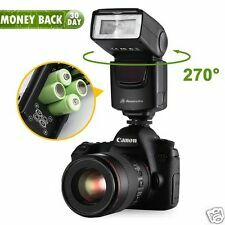 For bounce flash, the flashgun head can be tilted up and to the right by 90 degrees, or to the left 180 degrees. It can also be tilted down by 7 degrees allowing ease of use for close-up photography. 1 x TT560 Flash Speedlite (without battery). Flash mode: M, S1, S2. Flash duration: 1/800s~1/2000s. With a soft box, and mini stand, convenient for your use. If you are satisfied with our service, pls. For Canon 750D, 760D, T6i, T6s, 7D Mark 2, T2i, T3i, T4i, T5i, 550D, 600D, 650D, 700D; Nikon D500, D5500, D750, D7100, D7200, D800, D800E, D810; Sony A6500, A6300, A7 II, A7R II, A6000, A7, A7R. 1 Macro ring head.